Full Box of 152 pieces 16' long. 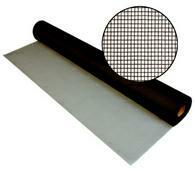 The 5/16" X 3/4" Window Screen Frame is made of .020 mill thick, roll formed aluminum. It is cambered (slightly bowed) to retain screen tension when installed. It will accept .150 screen spline with fiberglass insect screen. This size frame is found on most half screens in the US. Fits our Square Cut, Solid External, Internal Plastic or Internal Metal Corners. Great stuff and price. Just what we were looking for!!! I've appreciated doing business with you. We'll reorder when we get through these supplies.